will lead you through a mystical, mesmerizing 5-Day Journey through workshops, healing and ritual. Full Moon in Libra Closing Ritual followed by special group dinner in the garden of the Riad by in-house chef. Via daily meditations, ritual and excursions with our private shopping guide and optional excursion to the stunning Atlas Mountains. The setting is a 200 year old silk traders palace, named Enija. 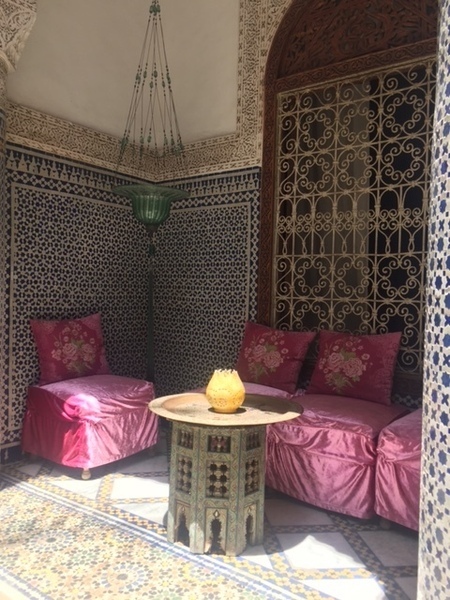 The noise and hustle and bustle of narrow alleyways of the Jemaa El Fnaa Square in the Medina disappear as if by magic to be replaced by the gentle gurgling of the fountains and birds singing in the garden the end result of which is, of course, utter peace and a total escape from it all. 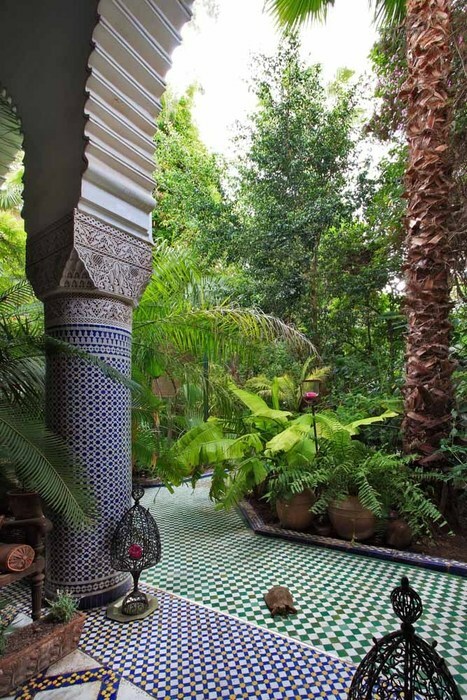 This beautiful Riad has 12 spacious and enchantingly decorated rooms and suites, tropical gardens and fountains around each corner. 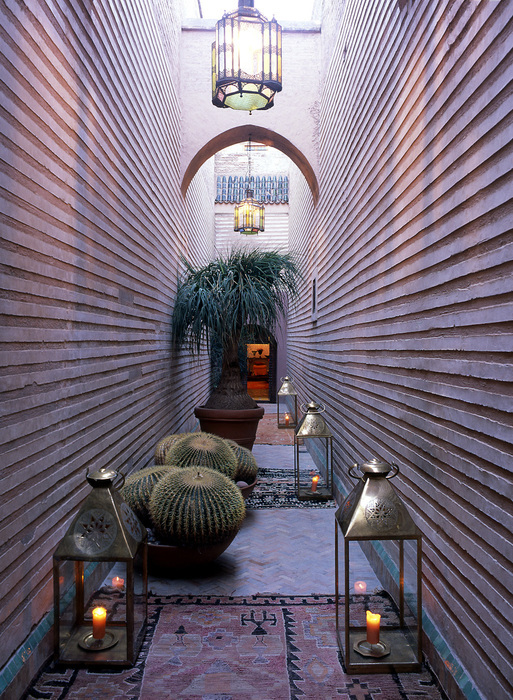 Perfect to host a mystical retreat, the magic does not end here, as you open the doors you step into the heart of Marrakech’s humming souks, collorful alleys and bustling bazaars. There is a famous private in-house chef creating the most authentic, sensual and healing Moroccan cuisine you can imagine. 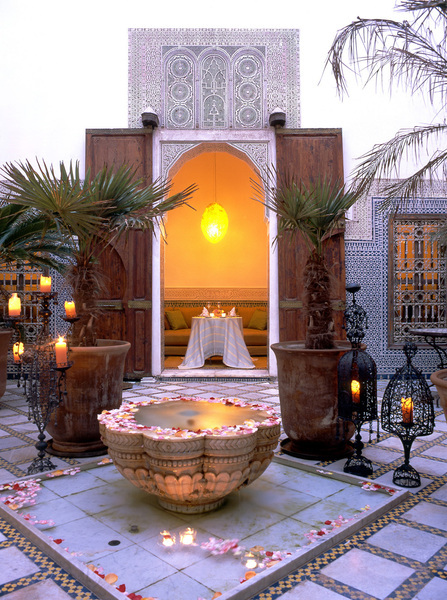 The famous Moroccan tea ritual is an integral part of this paradise. Working with the Empress/and your Venus Archetype: Through Jungian Active Imagination meditations, we'll hone in on your personal relationship with the Goddess of Beauty and Love. Invoking Lakshmi: The Goddess of Material and Spiritual Wealth through meditation, mantra and ritual. glamour magic at its best, from hair brushes and mirrors to commanding a room with a nod. A romantic ritual filled with poetry, art, magic, herbs and ritual wishing. Manifesting through images. How art, poetry, and song can formulate the perfect long term spell. How to do healing body work on yourself and others. Roots of the issue. A conversation with the inner critic and how to understand/transform the self-sabotage. Within the ritual space each day we will take you on a journey of self- love and care through the power of Venus. Immense healing can be done by working through old ancestral issues and understanding the land magic and energy of those who walked before us. Our ancestors walked this earth dreaming of us in their futures. There will be storytelling and meditations to take you to the Elder's fire. We'll lead you into the chambers of the heart and soul purpose to mend what needs our attention and care and create rituals around our lives including healing touch, getting to the root of issues, creative spaces to allow our hands, words, and tongues become tools of manifestation. We'll step into glamour magic through tea leaves, ritual, and photographs and teach you easy ways to hone into the glamour and magic that surrounds us. And we'll walk into the world of wishing and manifestation. A beautiful long term spell that is malleable and everlasting. There is beauty all around you. This week long retreat is the secret door to deepening your relationship to love and overflowing riches on all levels. Elaborate breakfast/brunch with homemade breads, moroccan omelettes, fresh orange juice and fruit, Turkish coffee and more. The airfaire is not included as well as transportation to the Riad (We will help you coordinate transportation with the Riad directly). Fly to Marrakech (RAK) for early evening of the 12th. You can also fly direct to Paris and then book a cheap flight on Air Maroc or Easy Jet to Marrakech. Sherene Schostak, M.A., is a Jungian Analyst, author and a professional astrologer in private practice in San Francisco and New York City for the past nineteen years. Her yearly pilgramges to India have inspired her unique approach to combining the spiritual, the somatic and ritual elements to her work. She is the co-author of Speculation Now; Transpersonal Astrology: Explorations at the Frontier, & Surviving Saturn's Return (McGrawHill), Dog Stars (Penguin Putnam) and Fate of your Date (Chronicle Books). She is the resident astrologer for both Elle UK and Anne Taylor, LOFT. She created Project 40: a Forty- Day online alchemical Jungian journaling intensive since 2010. She holds a Master’s Degree from New York University in Clinical Psychology, and a Master’s Degree in Psychoanalytic Studies from the New School for Social Research and her post-graduate studies via ISAP (Jungian Institute) in Zurich. Sherene holds certification from the D.O.M.E. the Inner Guide Meditation Center, as an Inner Guide Meditation Initiator. She teaches classes and workshops internationally. Katelan Foisy is a multimedia artist, occultist, and writer. Her fine art pieces have been displayed at The Worcester Art Museum, Ohio History Museum, MODA, WEAM, A&D Gallery, and Last Rights. She has graced the pages of the Grammy Award programs and the stage of Cynthia von Buhler's immersive historical plays "Speakeasy Dollhouse" and "The Brothers Booth." 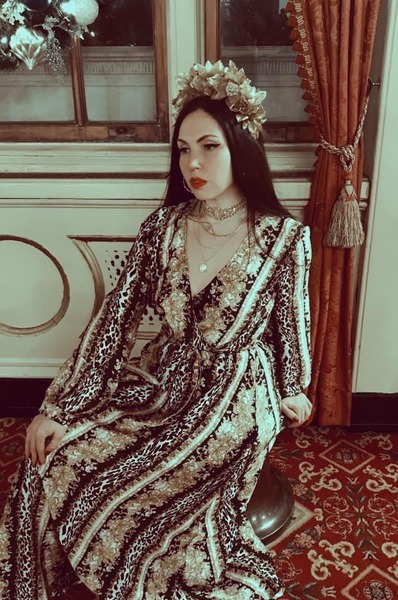 Katelan has been featured in NY Times, Elle magazine, Paper Magazine, GQ Italy, Time Out NY, Witches & Pagans, and many others—for her work as an artist,curator and occultist. She has written for Motherboard/VICE, Electric Literature, Luna Luna, ERIS magazine,COILHOUSE and held events with Atlas Obscura and lectured at Morbid Anatomy. Her short films have been shown at Cinamatique Francaise as part of the Romani Avante Garde Film Sessions and illustrations are featured on The Smashing Pumpkins "Shiny And Oh So Bright Tour" as well as William Patrick Corgan's "Ogilala" tour. She is the artist for the Sibyls Oraculum with Tayannah McQuillar and the forthcoming Hoodoo Tarot . Chaos of the Third Mind with Vanessa Sinclair will be released in 2020 from Fulgar Ltd, UK. She was called a “Female Jack Kerouac” by Taylor Mead, a “Modern Day Francesca Woodman” by Cynthia von Buhler, and William Patrick Corgan has said, "They used to burn witches like Katelan."